Every once in a while you’ll come across a text that answers a lot of questions you’ve wanted resolved and introduces new ones at the same time. 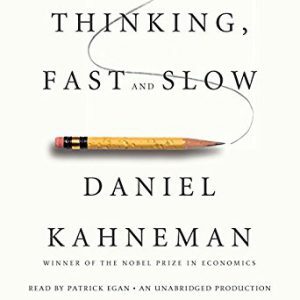 Daniel Kahneman does that with “Thinking, Fast and Slow.” It explores how the human mind makes decisions and what processes support it and what biases inhibit it. There are a lot of important considerations to take from Kahneman. First off, did you know that people’s eyes dilate when they’re concentrating? What about how self control requires deliberate thought and draws energy to do so, and can be depleted during a day? One of the more controversial ideas conveyed is the priming effect, which is a way to inject prejudice towards a certain outcome by manipulating the target without them realizing they’re being manipulated. One of these is through repetition, which states that the more someone hears something, the more likely they’ll believe it’s true. There’s also “anchoring”, which is placing a number in someone’s head that manipulates someone’s bargaining position. For example, if I offer way, way less than what something is worth I am essentially priming you towards that lower number. You may negotiate from a lower position than you would have if I gave you a higher number. Priming is a very controversial concept though, and its up in the air if it’s actually a phenomenon, with Kahneman himself admitting he might have given more credence to studies than necessitated through statistical analysis. I really like the heuristics that he talks about throughout the book. Decision making biases, or heuristics, are real and people should be aware of them. For example, a familiarity heuristic is the tendency for people to ascribe the same assumptions between different situations because they see similarities in them, which may not be correct. This is especially high during situations where there is a high cognitive load. One takeaway is that the brain is constantly trying to take the path with the least amount of obstacles in it. Real world applications deal with risk analysis, so if you’re in the corporate world, this book could be exceptionally helpful. I also like the idea of “regression to the mean”, which is a statistical concept that outliers tend to come back to average, so don’t get too hung up when you see a high performer, because chances are they’ll come back down again. I often use this concept when judging different alternatives. If there’s one important lesson learned it’s related to what I mentioned earlier about self control. I always thought self control was about discipline. I thought people who gave in to their temptations were just weak willed. But, that’s not the case. For example, I was always baffled in high performers who made terrible decisions in their private lives like committing infidelity or stealing from their workplaces. If you’re a high performer, chances are there are more demands on you than what the average person can handle, and after a while they just give in to their temptations because they can’t ignore them anymore. Take the example of infidelity, evidently workplace cheating most likely occurs at the end of the day when glycogen levels are lowest. I’m not trying to dismiss their behavior or rationalize it, I’m just saying there’s more going on than what we know. How this is helpful is realizing we all have short fuses throughout the day and we need to structure them to take that into consideration. Things that are difficult need to be done in the morning, when are blood sugar is the most level. I had this all backwards. I used to “clear the deck” by knocking out all of the mundane tasks in the morning and then concentrating on the hard stuff in the afternoon. I totally had that backwards, so now I do the opposite and it’s been good for me. If you are looking for some good scientific evidence to improve yourself and “hack” your thought processes so you can run at a higher level, I’d put this book into that category for sure. Copyright 2018 Joshua Rust. All Rights Reserved.